Brainstorming and outlining can be a struggle for inexperienced writers, especially second language writers, who are unfamiliar with process techniques. However, by applying the framework of a round robin, teachers can help students seize on the opportunities afforded by both collaboration and prewriting activities. Put students into small groups. Give each group a different writing prompt. Give groups 15 minutes to brainstorm their major supporting points on scratch paper (no details). Circulate and assist as necessary to answer questions. Give each group a different colored marker and a piece of butcher paper. Have them write their writing prompt and three major points on the paper. Tell students to leave plenty of space under each point. Have groups stick their papers on the walls and/or whiteboard. Leave plenty of space between each one. With the groups standing in front of their station, direct them to circulate clockwise to the next station, bringing their colored marker with them. Have the groups look at the new topic and points at their next station. Then ask them to add 2-3 supporting details below each of the major points. Make sure each group uses its designated colored marker to help keep track of who is contributing what. Finally, tell the groups to circulate clockwise to the next station. Ask them to write the thesis statement and topic sentences for the outline at the third station. 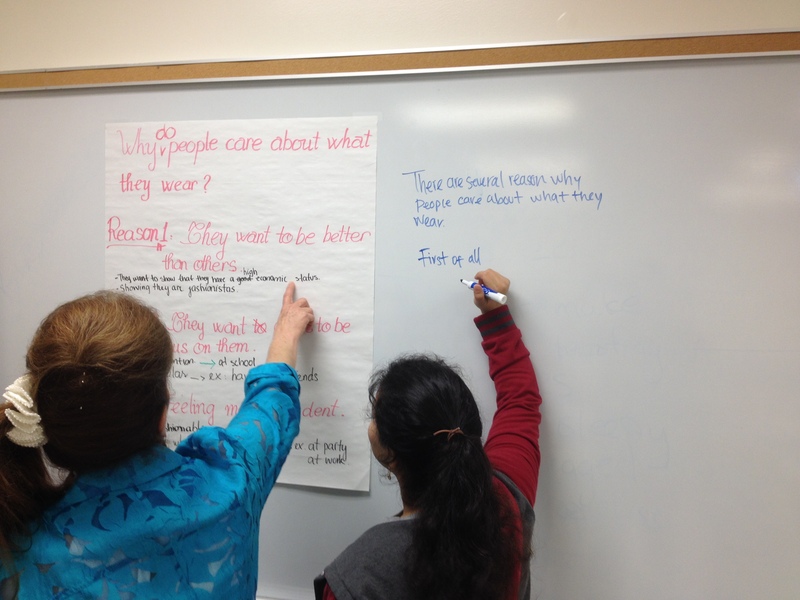 Allow students to write them on the whiteboard and/or another sheet of butcher paper. Listen, monitor, and facilitate as necessary. Ask the groups to return to their original stations to review what was added by the other groups. Have them identify whether the supporting information and sentences reflect their initial ideas, and why. To close, have students compare the thesis statements and topic sentences around the room to help them notice ways to vary their language without being repetitive. This activity benefits students because they are working together to formulate ideas and respond to the ideas of others. Working with someone else’s ideas also teaches them the importance of audience and clarity. For example, teachers may overhear comments such as, “I don’t’ understand their second point,” or “What do they mean by X?” In these cases, groups may end up revising the ideas themselves to give the points greater clarity. As students put up their reasons and moved to other stations to add the details, they were actively engaged in trying to understand the original group’s intentions and support their points. Sometimes they debated about whether the main reasons or effects made sense or not. Some decided to improve upon the original group’s major points, altering them so they were clearer. When students wrote the thesis and topic sentences at the third station, they also negotiated the language they needed to use to present each point. Finally, each group was able to return to its original station to see how their outline had evolved due to participation from the other groups. Some noticed supporting ideas they had not thought of, helping them to see the topic from a different perspective. 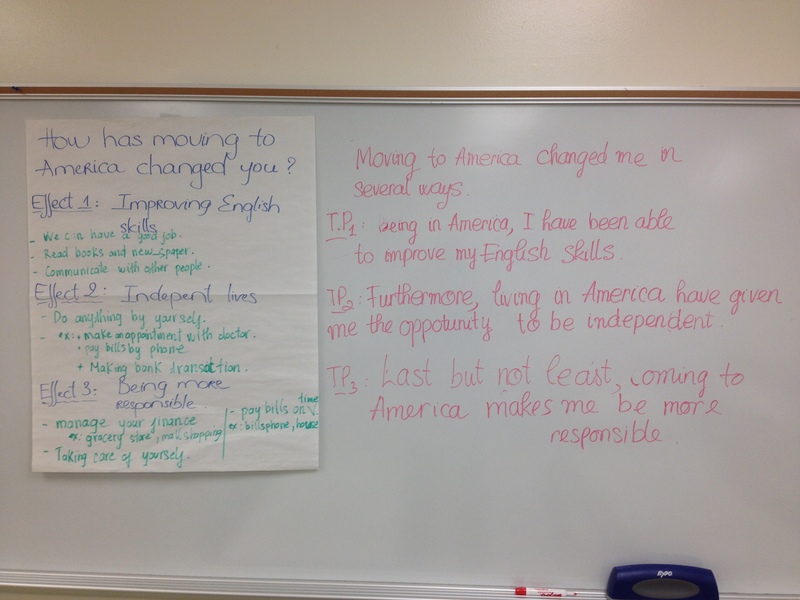 Others saw new ways to use language to write the thesis and topic sentences. It was essentially a different form of a peer review, but one that was perhaps more engaging as it required physical movement and active negotiation before drafting. After completing the round robin, students had experienced the development of at least three different essays, helping them to narrow down which one they wanted to choose for their own essay. The stations also provided models for students to use as they personalized their individual outlines. Social learning theory proposes that we learn through shared experiences because it is a process of negotiation. When it is done effectively, it allows the students to do more of the learning, leaning on one another to solve problems and figuring things out for themselves through the process. It also gives teachers a rare opportunity to step back and listen to their students learn, allowing the activity to do the teaching for them. Great writing lesson idea! Thanks for sharing! Thanks for reading! Let us know if you try it out. I tried it in my class and it worked great! !